Make Cats Cradle units quickly, easily and accurately, two at a time from squares and rectangles. You never cut a single triangle, but with the Cats Cradle tool you end up with perfect triangles in your finished blocks every time. Create six sizes from 1 1/2 to 4 inch finished blocks - the cutting requirements for each is printed right on the ruler! The ruler slides easily over the fabric until pressure is applied. Then, our exclusive gripper holds the fabric in place while cutting, eliminating slipping and miss-cuts! The ruler comes with fully illustrated step by step instructions or scan the QR Code printed on the ruler to view a video demonstration. 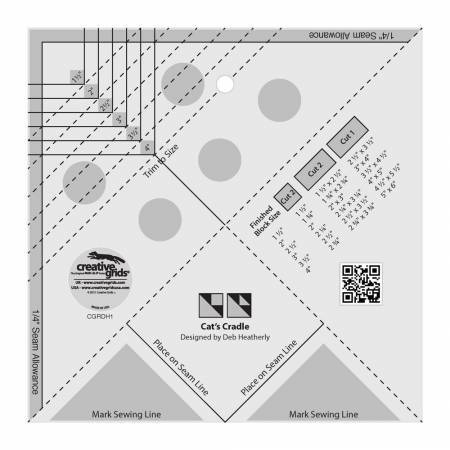 Creative Grids Rulers have a MAP (Minimum Advertised Pricing) Policy. Please do not advertise them for less than the suggested retail.